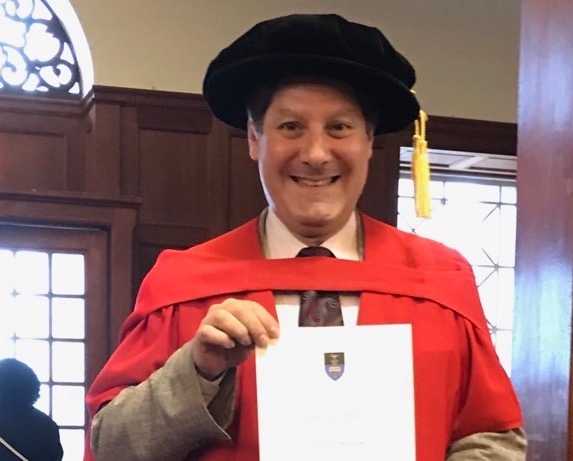 UCT SpaceLab's guest lecturer Ken Davidian has been awarded a PhD by the UCT Graduate School of Business for his work on the nascent human suborbital spaceflight industry. Dr Davidian works FAA's Office of Commercial Space Transportation (AST) in Washington, DC, where he is AST Director of Research and Program Manager for the FAA Center of Excellence for Commercial Space Transportation. Mr. Davidian's currently serves as a member of the Ohio State University Aerospace Engineering External Advisory Board, Associate Editor of the New Space Journal, co-chair for the IAA "Public/Private Human Access to Space - Earth Orbit and Beyond" study group and Chair of the IAF Entrepreneurial & Investment Committee. Previously, Mr. Davidian led the AIAA Commercial Space Group and was the AAS VP of Strategic Communications. In 1983, Mr. Davidian began his career at the NASA Lewis Research Center in Cleveland, OH, working in the area of analytical and experimental research on the performance of liquid rocket engines. Between 1997 and 1999, Mr. Davidian was assigned by NASA to work as the Assistant Director of Operations for the Summer Session Program at the International Space University in Strasbourg, France. In 2001, Davidian left government service and entered the private sector and worked for Paragon Space Development Corp. as a consultant in the role of Director of Operations for CargoLifter Development near Berlin, Germany, as Director of Operations for the X PRIZE Foundation in St. Louis, MO and then again for Paragon as corporate Program Manager in Tucson, AZ. In 2004, Davidian moved to Washington, DC to work on NASA's prize program, Centennial Challenges. He started as a contractor and then reentered civil service when he was hired by NASA Headquarters in 2007, as the Program Manager for Centennial Challenges. Davidian received his BS degree in Aeronautical and Astronautical Engineering from the Ohio State University in 1983, and an MS degree in Mechanical Engineering from Case Western Reserve University in 1987. He attended the International Space University Summer Session Program in 1989.